There’s plenty of food around at Christmas – not all of it good for us! Seasonal vegetables like parsnips and pumpkins aren’t just nutritious, they’re also perfect for making into Christmas side dishes. Here are some exciting ways to enjoy your vegetables this season. 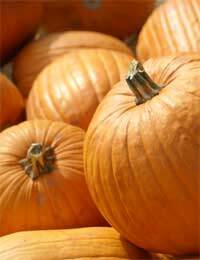 Pumpkins and squashes are harvested in the autumn and stored all winter. Their quality doesn’t depreciate for months, so you can enjoy them at their peak right through to the spring. For the uninitiated, pumpkin can seem like a bit of a chore. You’ll need a big knife and strong arms to hack them up, and the skin can be difficult to get off. But perseverance pays off richly! Pumpkin or squash makes a slightly sweet, creamy side dish. These vegetables work beautifully with cream and mustard, white wine, parmesan, tomatoes, nuts and spices. Try making a rustic fondue: halve small squashes and scoop out the seeds. Fill the cavity with plenty of grated cheese and cover with double cream, then season. Cover with foil and bake in a medium oven until the pumpkin is soft (time depends on size). To eat, bring the shells to the table, and scrape the flesh into the cheesy fondue. Serve up or let people dive in with forks! Another underrated winter vegetable is the parsnip. Although we roast them on Christmas Day, most of us neglect parsnips during winter. Besides roasting to a sweet, soft morsel, parsnips take nicely to baking: try them in a creamy gratin (recipe below) or toss them in an oven-baked cassoulet. If you’re having a drinks party, parsnip crisps make a chic canapé. Peel slices using a potato peeler and drop into hot oil for a minute, until golden – drain on paper, and sprinkle with salt. Choose a good pumpkin for this recipe. It can be difficult to tell, but look for one that isn’t too big or small – Butternut, Crown Prince, Turk’s Turban and Uchi Kuri are good types. You could swap the pistachios for hazelnuts, and the parmesan for pecorino, for a similarly delicious result. Preheat the oven to 200 degrees C and oil a large baking tray. In a grinder or food processor, process the pistachios (plus chilli if using) until they are finely ground. Mix them with the parmesan. Put the beaten egg into one dish and the ground pistachio-parmesan mix into another. Dip each pumpkin piece first into the egg, then the pistachio mixture, and lay onto the baking tray. When the oven has preheated, put the tray in and bake for 30-40 minutes, or until golden and crispy. Soften the leeks in a pan with the butter, until they’re just translucent. Add the garlic and cream and heat gently to just below simmering point. Set aside to infuse while you slice the parsnips, as thinly as you can. Butter four ramekins and pour in a little of the cream. Start layering the parsnip pieces, adding a little cream and seasoning between layers. Finish with the remaining cream. Cover the dishes with foil and bake at 200 degrees C for 50–60 minutes, uncovering for the final ten minutes.